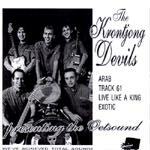 A fine single in all the trashy glory the Krontjong Devils can muster. A cruddy vocal titled "Live Like A King," plus three ultra reverbed surf classics powered as only they can. With the dwell set at 11, these Dutch cats pummel anything remotely resembling peace and tranquility. Jim Messina and the Jesters' "A-Rab" is powered, reverbed, amped, and trashed in a most delightful way. Excellent playing under extreme reverb with infectious energy. This is huge and mean. This is one thrashy ultra reverb version of Sandals' "TR-6." It lacks the chunk and chop of their infectious remake, but has so much exuberance that it doesn't matter. Big, swimming in reverb, and fast. So, was the artwork messed up from notes abbreviated like maybe "TR 61?" Who knows. Bob Vaught & the Renegaids' arrangement of the Bruce Morgan surf standard, extra muddy sound, and a ton of energy. Crude, but so tuff it passes muster.